The Cowan Report: Did David Cameron Mess Up Or Was He Deliberately Trying To Mislead Residents About H&F’s NHS? 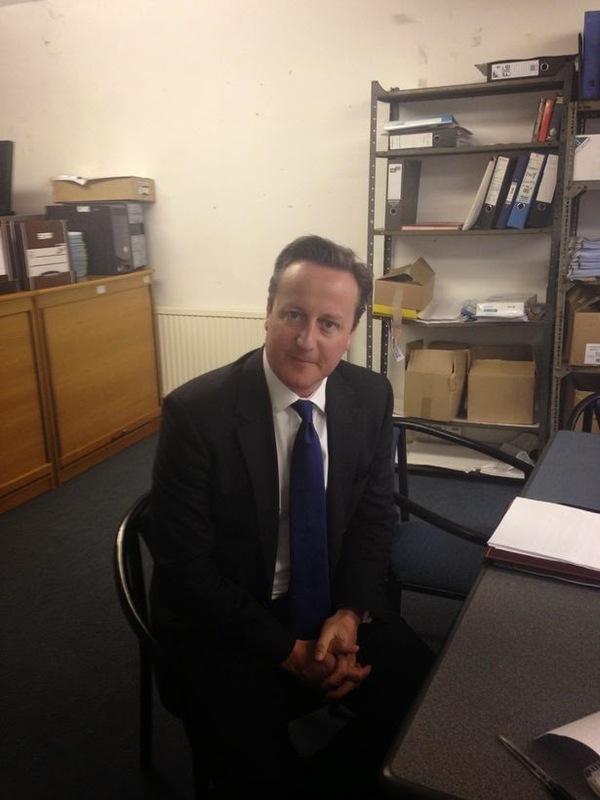 Did David Cameron Mess Up Or Was He Deliberately Trying To Mislead Residents About H&F’s NHS? A leading Conservative politician in his fifties recently told me he thought David Cameron was the most “policy-light” Prime Minister of his life time. Mr Cameron’s blasé approach was again on show last week when he made a last minute, change-of-schedule and rather panicky election visit to Hammersmith and Fulham – commonly known as “Cameron’s favourite council”. It has apparently come as a surprise to Mr. Cameron that the public have seen through the Conservative/Lib-Dem government’s plan to demolish Charing Cross Hospital and replace it with a GP-led clinic just 13% the size of the former hospital. Rather cunningly the government and our local Conservative run council have agreed to call this new clinic a “hospital” - which I guess they must have thought would do the job and get them through this controversial hospital closure. It hasn’t and residents are rightly furious. This is the deal Hammersmith and Fulham’s Conservative councillors signed up to. “Charing Cross Hospital’s A&E department would close, as would the hyper-acute stroke unit, intensive care, all surgery, and all major functions. The nearest A&Es would be at Chelsea & Westminster and St Mary’s, Paddington. 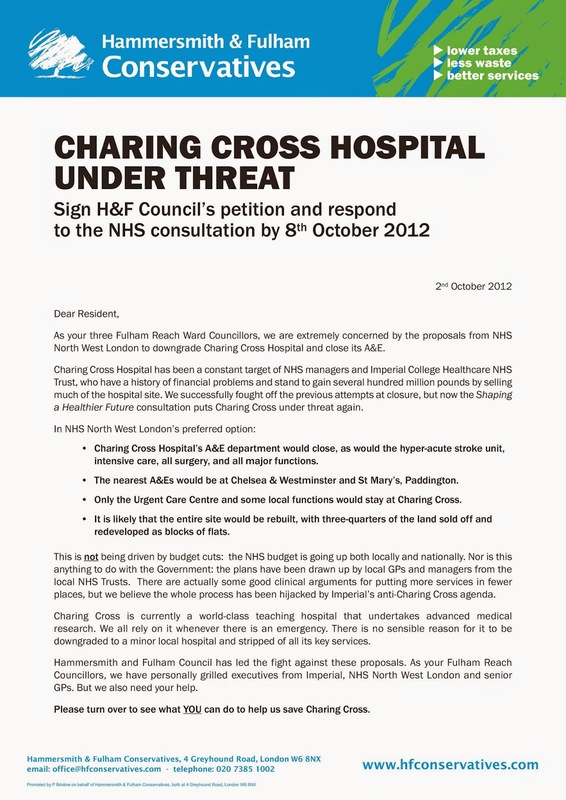 Only the Urgent Care Centre and some local functions would stay at Charing Cross. That letter went out two months prior to a journalist telling me how they had briefed him that they planned to leave the residents-led, cross-party Save Our Hospitals campaign. H&F’s Conservative councillors formally switched sides two months later on 7th February 2013 and became the only council in London to actively support the hospital closures. As you can see here, they then set about bombarding local people with tens of thousands of pounds of tax payer funded propaganda falsely claiming the Charing Cross Hospital has been “saved” and that our A&E has been “retained”. Mr Cameron’s emergency trip to our borough was no more that the latest chapter in this long line of subterfuge. It’s not the first time David Cameron has taken this unusual approach for a British prime minister. In 2010 he said that H&F Labour’s exposé on the Conservatives' plans for social housing were “appalling lies”. I wrote and challenged him – he didn’t respond but within a year the Conservative/Lib Dem government he leads had introduced everything we said it would and our local council had confirmed proposals to demolish hundreds of council homes - which is what David Cameron had wrongly claimed we were lying about. On the last occasion I took the view that David Cameron hadn’t been on top of the subject and didn’t know what he was talking about. This time, it really is very hard to give such a generous assessment of the reasons Mr. Cameron blatantly tried to misinform the residents of Hammersmith and Fulham.